Easy Living Footwear NEWS: Easy Living Footwear has arrived in Newcastle! 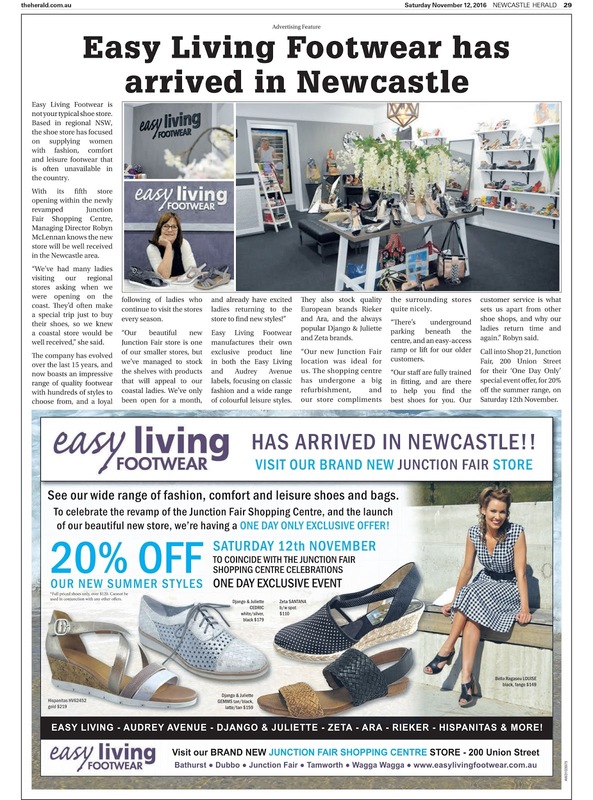 Easy Living Footwear has arrived in Newcastle! With its fifth store opening within the newly revamped Junction Fair Shopping Centre, Managing Director Robyn McLennan knows the new store will be well received in the Newcastle area. “We’ve had many ladies visiting our regional stores asking when we were opening on the coast. They’d often make a special trip just to buy their shoes, so we knew a coastal store would be well received,” she said. Th e company has evolved over the last 15 years, and now boasts an impressive range of quality footwear with hundreds of styles to choose from, and a loyal following of ladies who continue to visit the stores every season. Easy Living Footwear manufactures their own exclusive product line in both the Easy Living and Audrey Avenue labels, focusing on classic fashion and a wide range of colourful leisure styles. “Our new Junction Fair location was ideal for us. The shopping centre has undergone a big refurbishment, and our store compliments the surrounding stores quite nicely. Call into Shop 21, Junction Fair, 200 Union Street, The Junction.